Embrace your off-duty style in a comfortable knit pull on jogger. 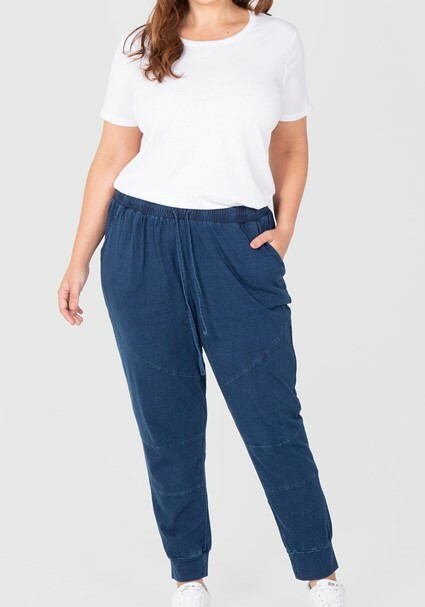 Crafted from an indigo yarn, washed back to give a denim look, the tapered leg creates a flattering silhouette. Add a white sneaker and you are weekend ready. Our model is wearing a size 16. She usually wears a curvy size AU18, and is 5‘9" (175cm) tall, has a bust 105cm, 112cm hips and a 86cm waist. - Fabric is stretch knit.